The calendar says time for some silliness with kids’ April Fool’s fun and what’s more fun than some easy pranks for kids and parents? Of course, one parent may need to coordinate with the kids. 1. 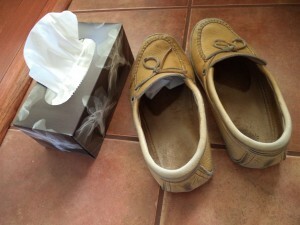 Give kids permission to take lots of tissues. With a few in each hand, they get to stuff either mom’s or dad’s shoes, so the shoes will feel like they shrunk. 2. With a sneaky switcheroo, kids can substitute their underwear for one or the other parents’ undies. Or they can switch mom’ and dad’s. Neither mom nor dad will accidentally wear the wrong ones. 3. If they can remember, whenever kids talk to mom, they call her “Dad.” Whenever they talk to dad, they call him “Mom.” This doesn’t usually last too long before kids giggle with glee. 4. 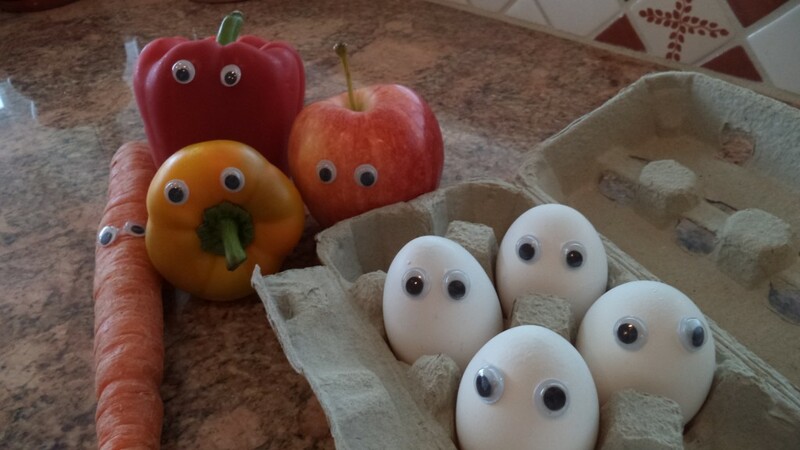 Have kids draw faces on the eggs. 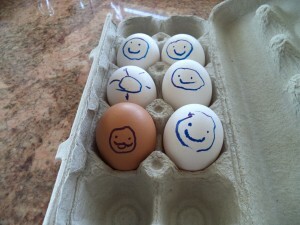 To do this, an adult needs to hold the egg while kids gently draw with a marker. Wiping up a raw egg is no joke. 5. Tuck a toy or stuffie into mom’s or dad’s bag or briefcase, or maybe their slipper. 6. If someone in the family has a lunch bag in the fridge, stick some googly eyes on their sandwich bag or piece of fruit. As adults, apparently we don’t laugh as much in a day as kids do. Yet, we know sometimes having a sense of humor is all that keeps us from going crazy. Laughing about a situation helps us stay sane. April Fool’s is an opportunity to share some laughter with our kids and to create some memories of fun. What can you and your kids do today for some adult and kids’ April Fool’s Fun? For a play-of-the-day, make sure you take advantage of today’s date to have some April Fool’s Day silly fun. These googly eyes are looking! For this fun, all you need is a package of googly eyes. You can either do this by yourself for kids and other family members to discover or you can ask a child to help put them on fridge or other items. Keeping a secret isn’t easy so maybe do it just before bedtime. **Note: buy the peel and stick eyes. I guess the joke started on me when I opened the package from the dollar store and there was nothing to peel off. I had to use tape. We’ve all seen videos of babies that laugh when a parent makes a funny face or noise, or even when someone rips paper. A sense of humor is quite complicated and kids need lots of experience to develop and expand it. Kids first have to recognize that something is out of the ordinary or unexpected. Then, they have to instantly check if it’s funny or scary and respond with appropriate reactions. This needs lots of brain activity to happen very quickly. April Fool’s Day is a great day for some silly fun. Maybe kids could put some pieces of clean laundry in the wrong rooms. At breakfast, pizza could replace the cereal. Change laces in daddy’s track shoes to rainbow ones. Instead of a napkin in a lunch box, send a dishcloth–a clean and dry one, of course. Sharing fun and silliness with kids is another way of connecting to them on an emotional level. Sometimes adults are afraid to be silly but many times a sense of humor is an important life skill. Today we all get a chance to make and look for silly fun. What will happen at your house for April Fool’s Day? One of the best ways to warm up a cold winter day is with some laughter and these winter jokes for kids will brighten up any grey. Q. 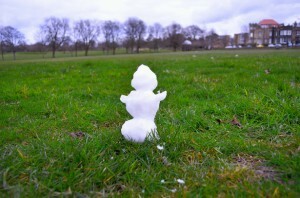 Why did the snowman cross the road? A. He was on a roll. Q. How does a snowman get to work? Q. What do snowmen like to drink? A sense of humor develops with experiences and it needs some complicated thinking skills. As children watch or hear something happening, they compare the situation to other similar occurrences. They quickly figure out if it is the same as usual or if it is unexpected. Then kids need to react, possibly by being scared, anxious, or delighted. Understanding a joke is even more complex because kids have to carefully listen to all the words and how meanings of words can be unusual. While even very young children will clue into the intention, taken as a whole, humor can be very tricky. No wonder that kids often mix up the punch lines in jokes or laugh at anything. They are still learning how the entire process is connected. Kids love to laugh. While it might be a myth that kids laugh 300-400 times a day, they certainly do so far more often than adults. I wonder if the number of times we laugh is related at all to the weather. 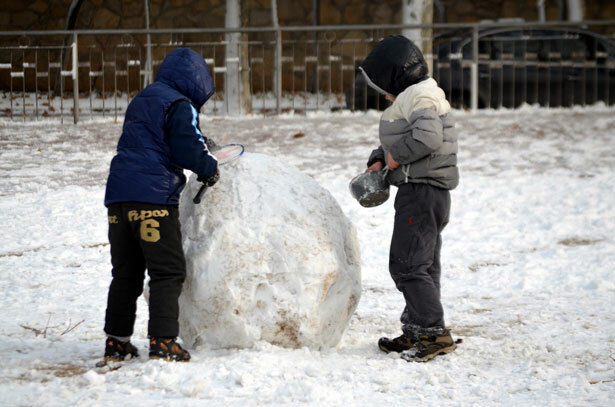 In any case, could you and your kids use some winter laughs? What are some other winter jokes for kids?